Morgan joins the cast of Violet, staring as Monty, at the Actors Co-op in Hollywood. "Some of us must journey far to find the beauty that lives within." Leaving her North Carolina home behind, Violet boards a bus and travels through the segregated South to be healed by a minister, convinced he can heal her scar, while discovering the true meaning of beauty along the way. 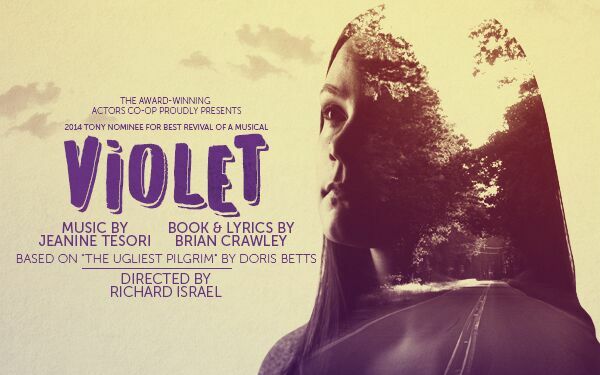 From American roots to folk to gospel, Violet (2014 Tony nominee) is a powerhouse of music and theatre with a score from Tony-winning composer Jeanine Tesori (Thoroughly Modern Millie; Shrek; Fun Home) and book and lyrics by the acclaimed Brian Crawley (A Little Princess). Performances begin May 11 and continue through June 17, Fridays & Saturdays at 8 PM and Sundays at 2:30 PM. There are two Saturday matinees: May 19 and May 26 at 2:30 PM. Tickets can be purchased on-line at www.ActorsCo-op.org OR you can call the box office at (323) 462-8460. If you want to save a little money, come with a group of six or more and the box office will cut you a special deal. In its 26th season of transforming theatre, Actors Co-op operates two 99-seat Equity-approved theatres. Called “a 99-seat miracle” by Daily Variety, Actors Co-op’s numerous awards for theatre excellence include the Los Angeles Drama Critics Polly Warfield Award for “Outstanding Season” (2013) in a small to mid-sized theatre, six Ovation Award nominations including “Best Season” (2013-2014), the Margaret Harford Award for “Sustained Achievement” in smaller theatre from the Los Angeles Drama Critics Circle as well as the Charlie Award for “Excellence in the Arts” by the Hollywood Arts Council.